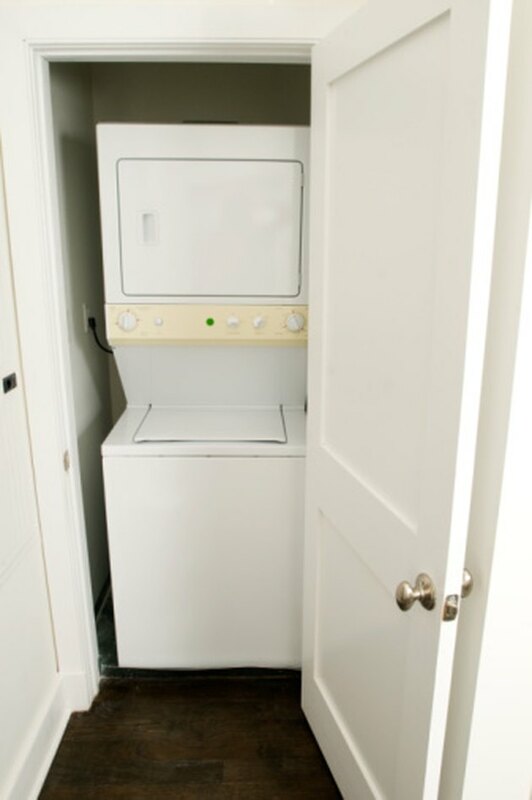 The General Electric Spacemaker is a stackable clothes washer and dryer designed for use in small apartments or tight laundry closets. The Spacemaker offers variable wash and spin combinations and three different wash cycles, temperatures and water levels for different load sizes. Available online or in select appliance and department stores, the Spacemaker washer functions well with standard care. However, when problems occur, there are some troubleshooting steps to take that can be useful in finding a solution. The washer and dryer should be connected to an outlet. Check the fuse or circuit breaker if necessary and replace or reset as needed. Close the washer lid and make sure a wash cycle is selected and the "Start" button is pushed if the washer has power but is not working. Examine the drain hose and remove any blockages or kinks if the washer is not draining. The top of the drain hose should be no more than 6 feet above the floor. Tighten the water hose connections and look for obstructions in the water inlet hoses and drain hose if water is leaking from the washer. Open the washer lid and even out the wash load if the washer is thumping during use. Do not overload the washer.